The Sewing Stiletto Kit is an invaluable sewing tool keeps fabric from shifting when sewing ends of seams and grabs and adjusts straying fabric with its sharp tip. 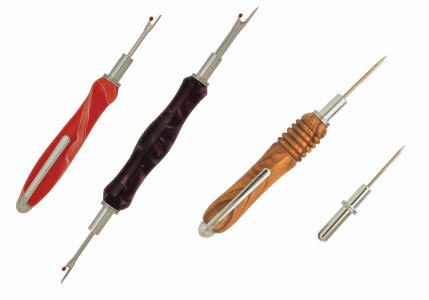 It's ideal for needlework, sewing, leatherwork and quilting. The stiletto tip is interchangeable with seam ripper blades so one holder can serve as a holder for either blade. Extra tips sold separately. Turned on the standard pen mandrel with the bushings sold below.